As I said in the opening to part one of this series, I love the flexibility of Hordes of the Things, particularly for building a miniatures army. 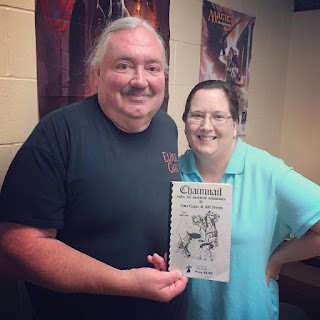 Wargames Research Group did a great thing revamping their De Bellis Antiquitatis rules, originally to be used for Ancient (and Medieval) wargaming but revised for fantasy battles. The beauty of their rules for me is, in part, being able to pick and choose from across many miniatures lines to build a unique army with its own particular flavor. To that end I am building my Dwarf army. I didn't have a Behemoth in my original army build but wanted some extra punch. So after turn three when some adjustments were allowed per the campaign rules developed by Jeff of Games Plus though based on the simple campaign rules in the HotT rule set, I began looking around for a suitable figure. People probably won't find this a coincidence that when I noticed a dusty box with a reduced price on the GP shelves I was drawn toward it. When I discovered just what it was, I couldn't resist buying it. This one has been around for a while, and though Emperors Choice still make a cyclops , the new one is a very different sculpt from this beauty by John Bager for their Giants of Arduin Series. As soon as I saw it, I naturally thought of Ray Harryhausen, then I bought it. Thankfully, it had been marked down, since it was a discontinued sculpt. As you can see, it is a good sized mini. I've got it glued to a 60mm x 60mm base, as per the Hordes of the Things rules, so obviously it is over four inches tall, and easily dwarfs (yup, went there) the other figures in the army. I painted it fairly close to the picture on the box, though with slightly darker skin tones and a lighter horn for contrast. It's hard to tell in these photos but the eye turned out well with some nice bloodshot lines. I'm also very pleased at how the fur on the shoulders and the legs looks too. Admittedly, there was a little more green stuff needed for the gaps than I would normally care to use but it worked out well and the base should come along fine with a few more rocks and some flocking after I spritz it with some matte finish.